After a long weekend of St. Patrick's Day celebration tonight was time to bring the yearly celebration to a close. And what better way to do so than with Rubens? I took a few liberties this year. 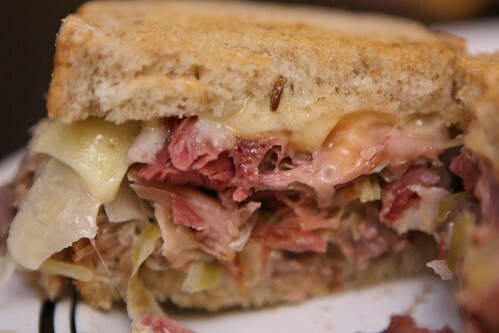 I used seeded rye bread; Gruyere (because, after all, that is a Swiss cheese); sauce of ketchup, mayonnaise, and relish; corned beef, Bubbie's sauerkraut; and, for good measure, some of the pork shank. Overall this may have been my favorite Ruben variation. It could be because of the pork but I also have a soft spot for Gruyere. Maybe it's because I went to Gruyere once and a waitress there compared me to a little boy who ate too much chocolate. 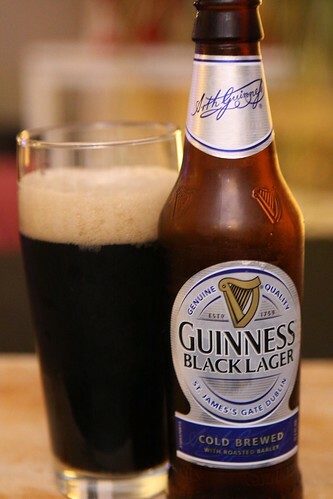 To complete the Irish beer weekend I ended with a lighter option, this Black Lager from Guinness. My cold is just starting to get good enough that I can start to taste things again. It's just kind of a shame that I chose to celebrate this event with a lager. It was a fine beer, just what you'd expect to have if Guinness Stout had a baby with Harp or some other boring European lager. Tomorrow we depart from the the fake Ireland dreamed up by Americans and return to the real America lived in by Americans. There will be less boiled meat but, I've got to say, the beer will be a touch more creative. I don't mean to judge Ireland too harshly based on the lame beers they tend to import. I'm sure there are some amazing beers being brewed there but what we get in America is pretty unremarkable. What wonders will await us back in America? You'll have to tune in and find out.